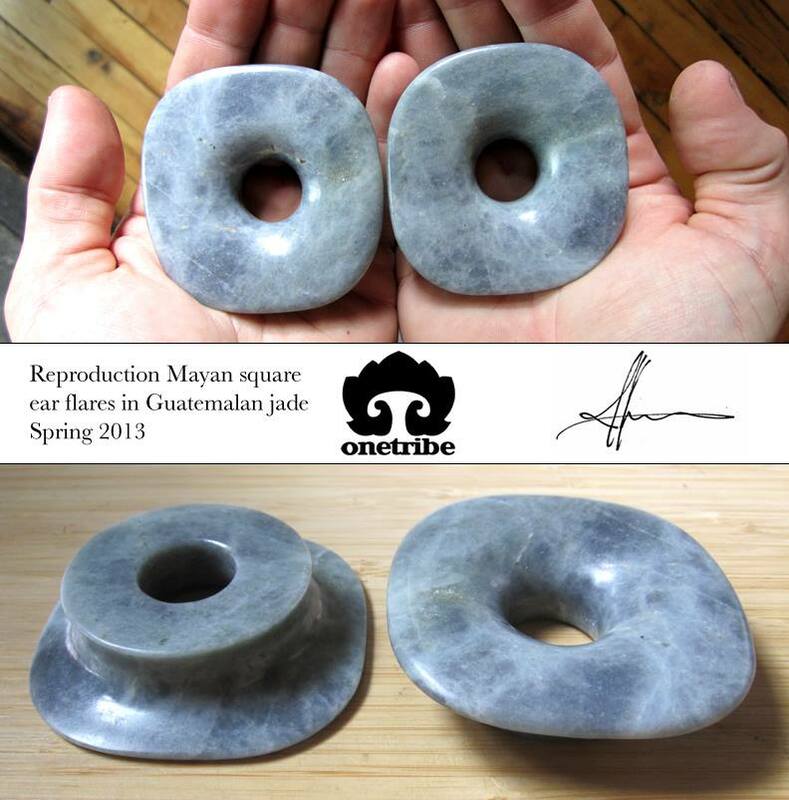 This project was a custom order for an individual interested in owning jade reproductions of a pair of square faced Mayan ear flares from the Onetribe antiquities collection. 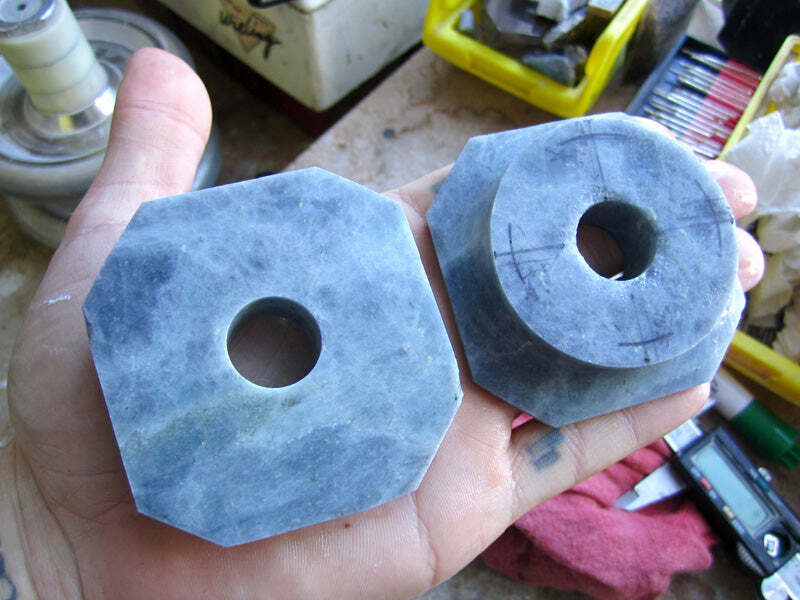 The antique pieces are carved from deep green aventurine and measure approximately 19mm in size with very unique huge squared faces. 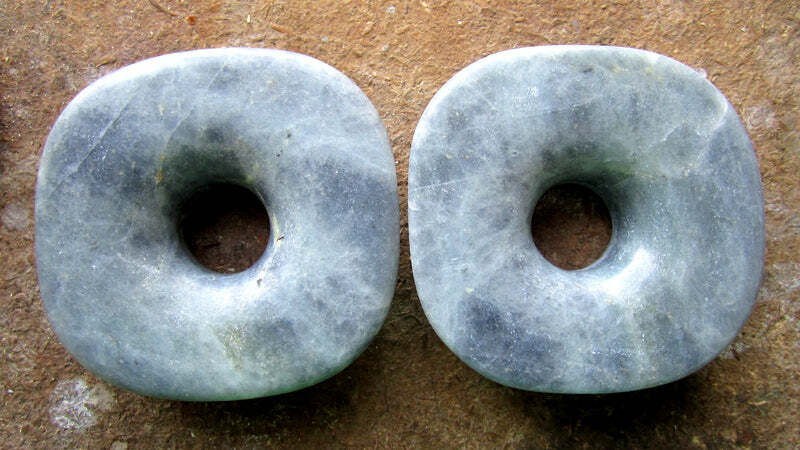 The originals likely had additional jade beads in both front and rear, and as a result had no rear flare to keep them seated in the lobe. This is necessary on modern jewelry worn as single pieces (especially with the weight of large front flares found on these historic designs) so the reproductions were created with wearability in mind, but retained the original outer contour and curves wherever possible. We had previously spent time doing incredibly detailed measurements on a few pieces in our antiquities collection for a research paper and that documentation proved very useful as we began to replicate the antique pieces. 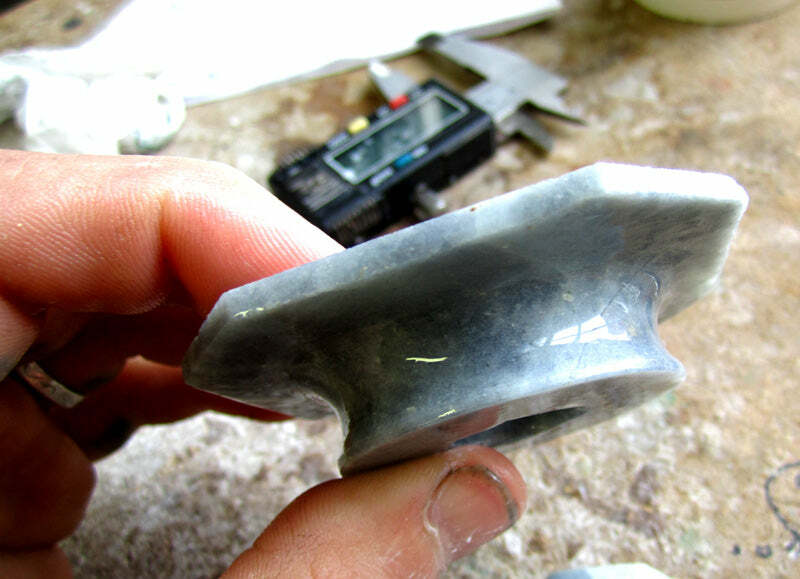 The material chosen was a beautiful "cloudy" blue-gray Guatemalan jadeite. 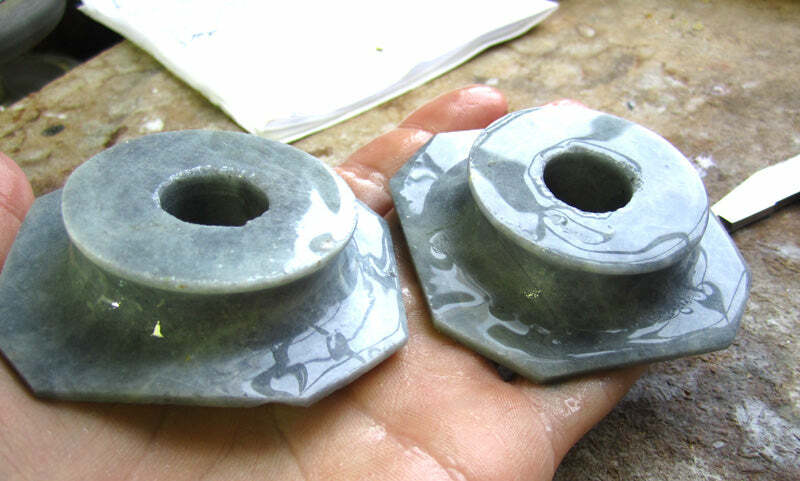 This material was used because it was one of the only jades we had in stock that was large enough for the nearly 3" (76mm) diagonal faces on these pieces, and because the Guatemalan jadeites are from the same source that Mesoamerican cultures used. 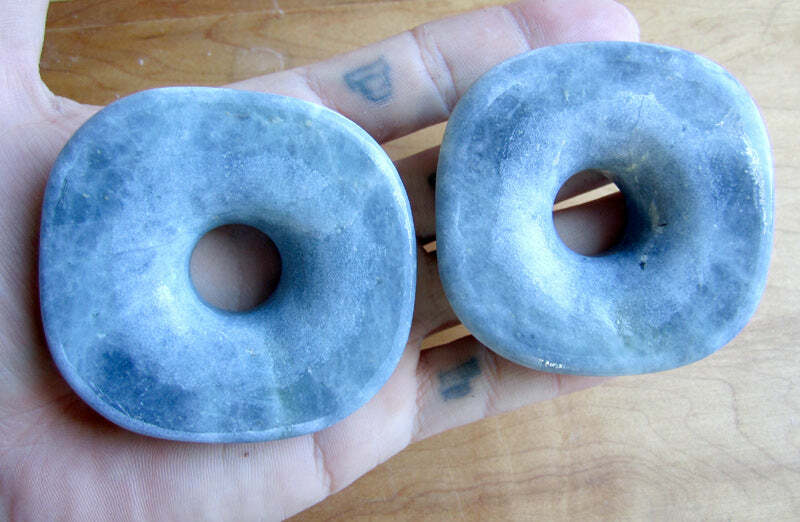 I consider the material culturally appropriate and the idea of creating these from a rare blue jade was very appealing to both Onetribe staff and the customer. 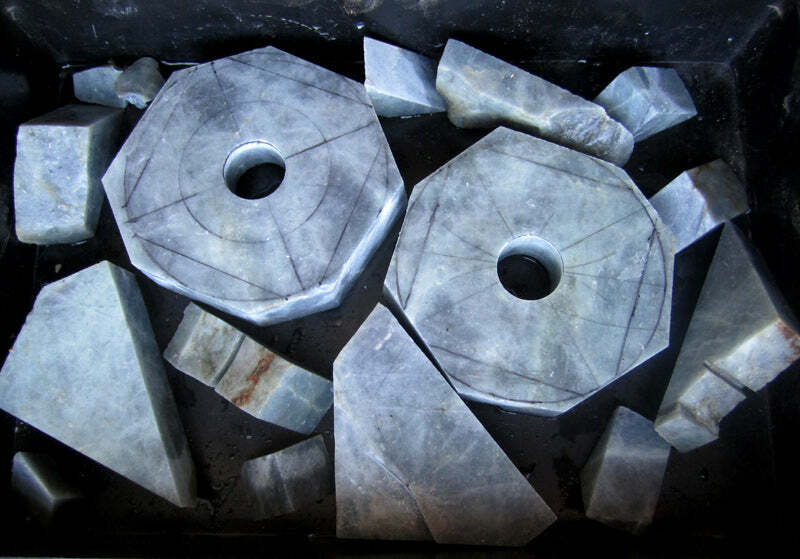 As shown in the above photo, the first step was simply to cut the large stone down to slabs of suitable size and start to lay out the design. Next, the excess material was trimmed away to form basic blanks which would be carved. 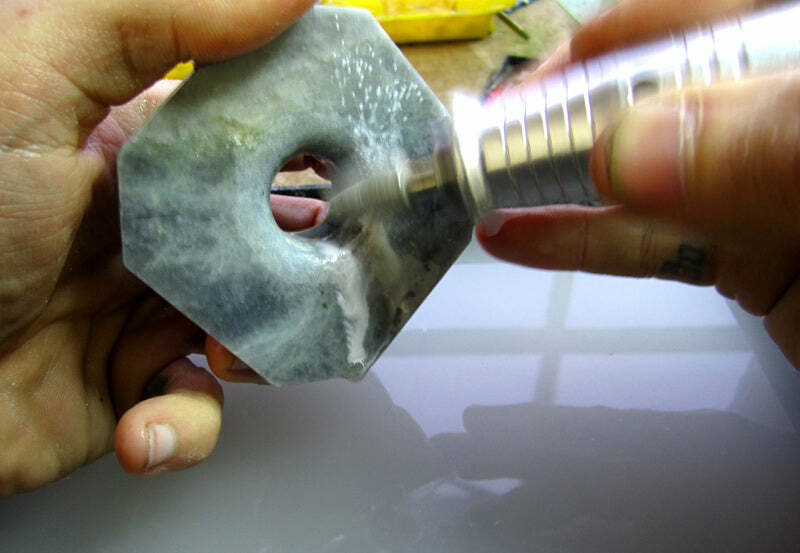 The center portion was also drilled immediately so that I could use the edge of that hole as a reference during carving. 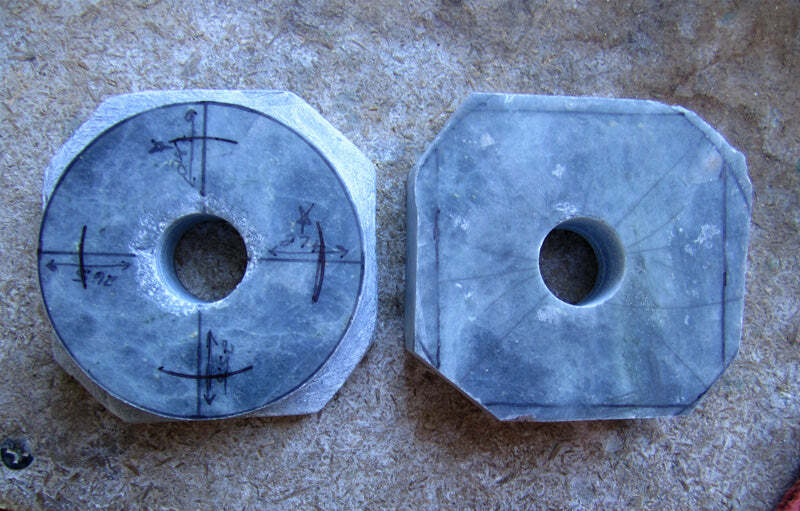 The actual finished design is asymmetrical, but to start, the largest dimension was squared and used to template the pieces for grinding the wearing surface so that everything stayed centered. Undertaking a large project that is going to take many hours over the course of several days generally starts with cleaning the workspace and organizing so that everything is within reach. 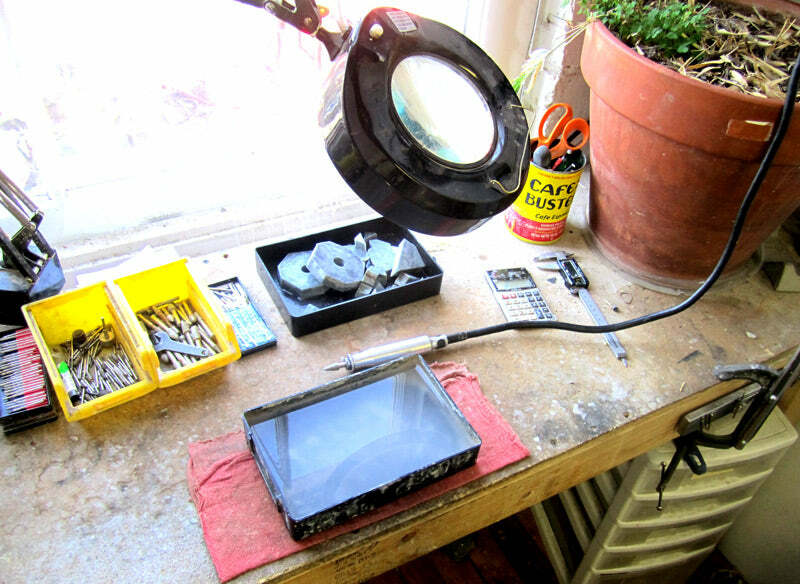 Some tooling needed to be moved around in the workshop so I took a while to rearrange and alter the workbench with some new cord holes (by hand of course!) so that everything would remain tidy. After that, we were ready to go! Immediately to the left of the hand carving area in front of the window in the above photo, the bench bends at 45 degrees, and that side houses the six wheel grinding units with various grits of diamond embedded steel wheels that you will see in many of these photos. 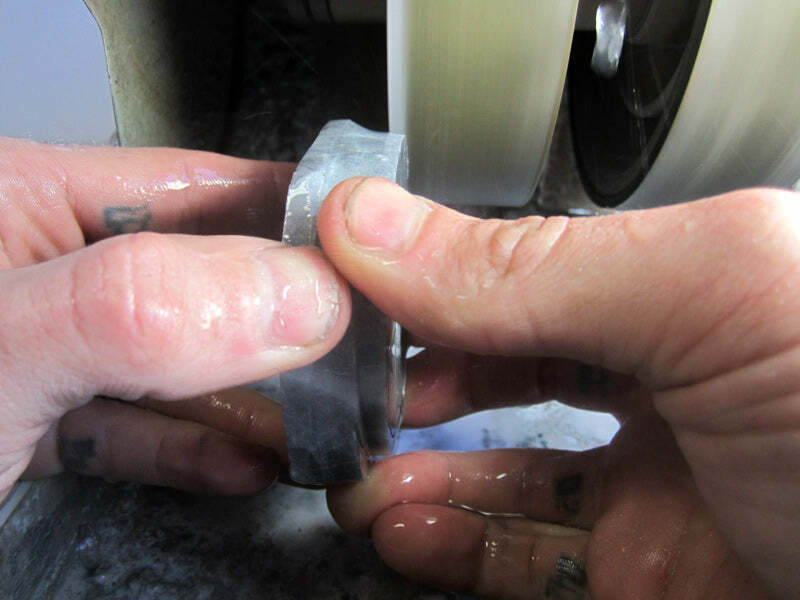 The first course of action was to begin grinding the rear portion that was to become the rear flare and wearing surface into a round contour, using the previously drilled hole as the center point to maintain accuracy. 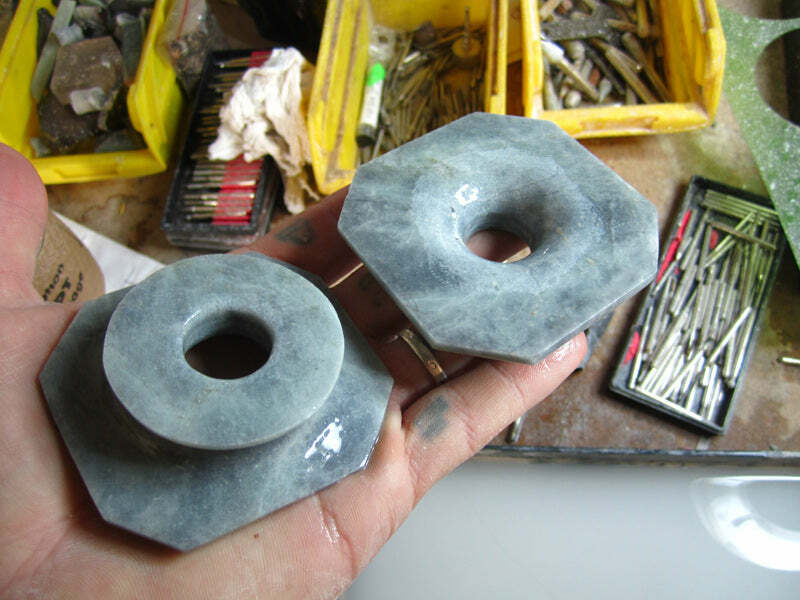 Jade is extremely hard, and these pieces are huge, so this project was a very time consuming, extremely loud and tiring process. The first piece has been ground perfectly round on the back side to begin forming the rear flare and wearing surface. 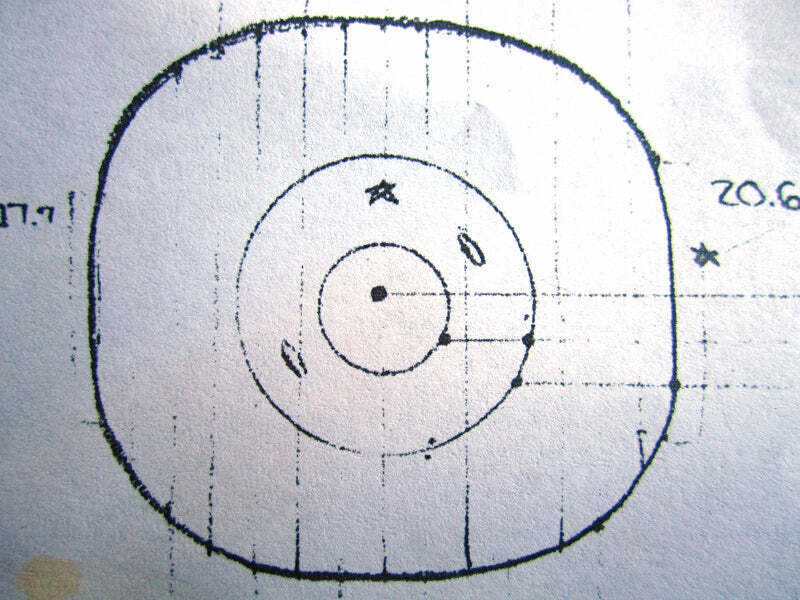 The four marks represent the amount of material that still needs to be removed, and the numerical notes are distances from various points (center to edge and to flare mark) for my reference. 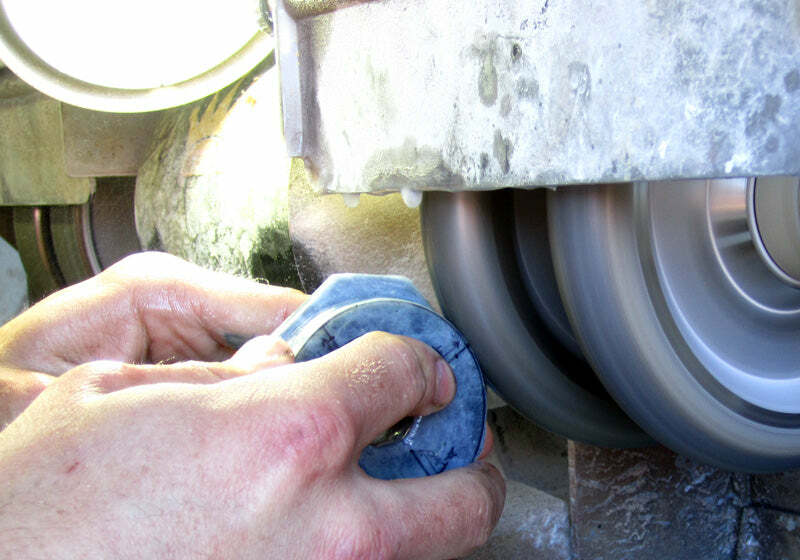 Removing material on a heavy grit wheel to speed up the process. 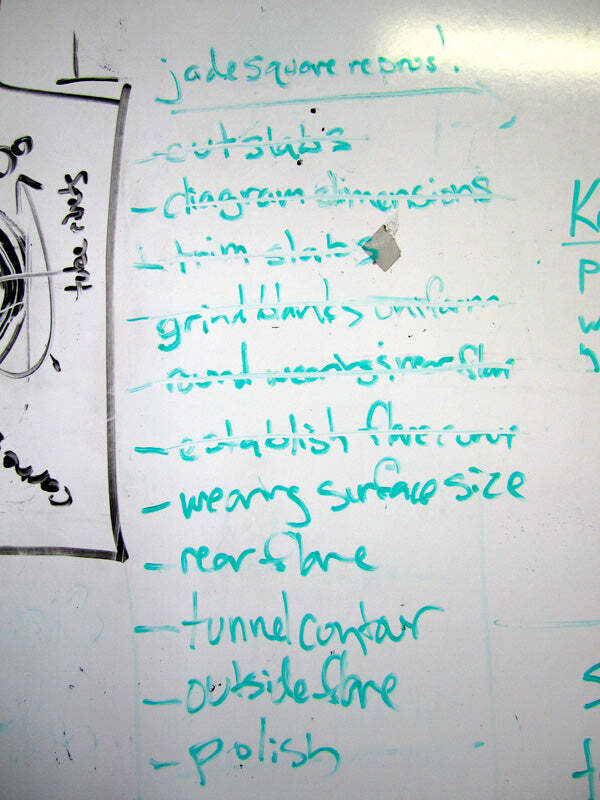 I also used this wheel to start the curve which slopes from the front flare down onto the wearing surface. Catching up on the second piece. 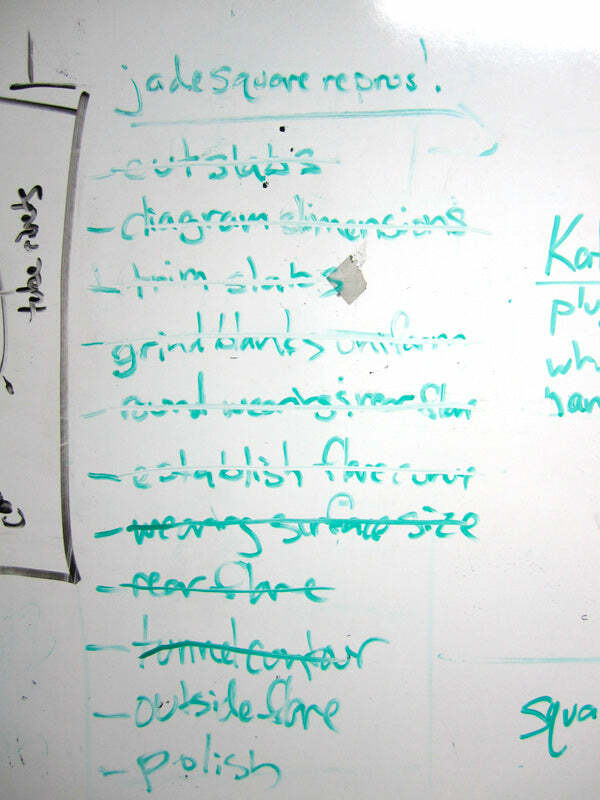 For long projects like this I tend to start a checklist (which you'll see later) and work both pieces to the next stage so that I am always able to problem solve with the pieces at similar stages. I call this "chasing" the first piece with the second. Below is a front and rear view of the stage shown above. 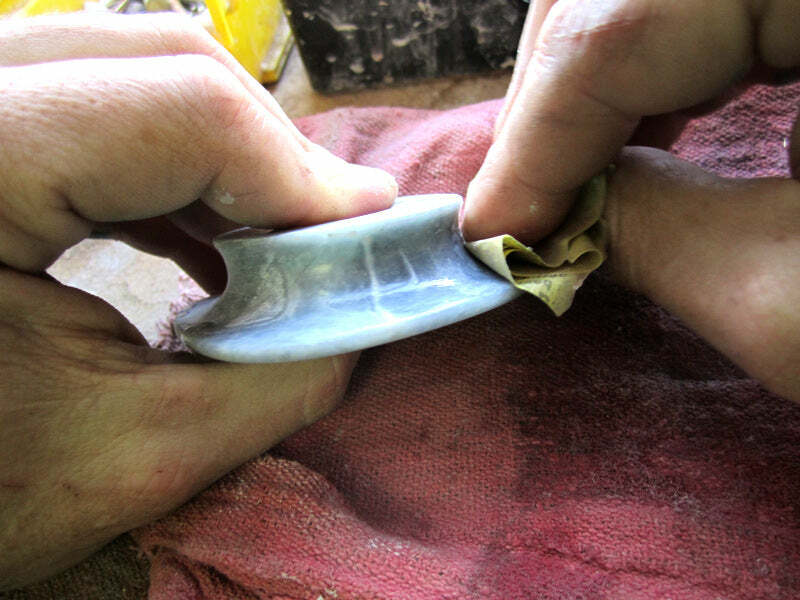 At this point it is time to shape the full curve for the wearing surface where the ear lobe will sit (between a rear flare and the large front flare), ensure it is an accurate 45mm in size, and to smooth the transition from the wearing surface up to the edge. 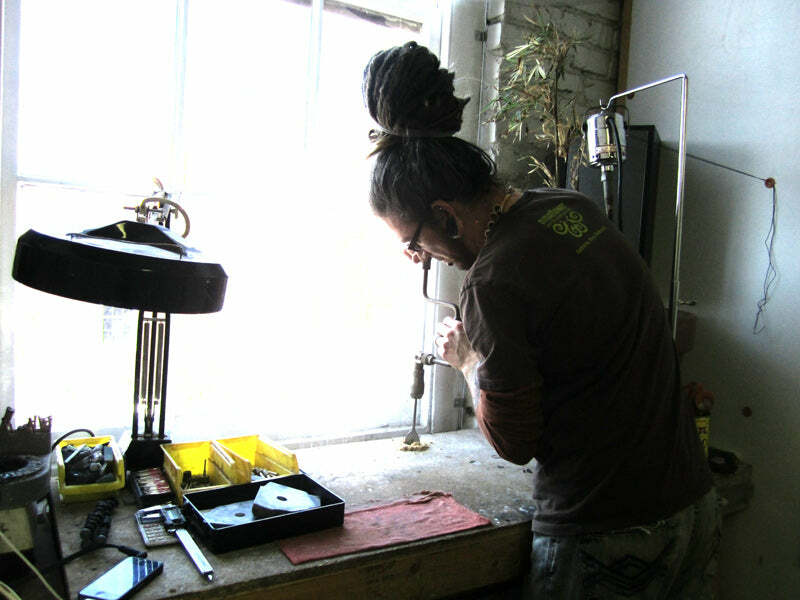 This is one of the more complex facets of the project because I have never carved any body jewelry with such large flares in relation to the wearing surface and had to wing it with the tools on hand. The front flare also becomes anxiety-inducing due to fragility at this point. Jade is tough but it does not tolerate stupidity. I have done some sketchy things to jade, and had my fair share of breaks, so much care was taken to avoid vibration and unnecessary pressure. With the wearing surface and rear flare pretty close to where they are supposed to be, it's time to start concentrating on the front. Working from the center outward, I begin to carve the harsh edge into a curved contour, smoothing it into the surface of the faces. Your friendly neighborhood jade carver after a late night carving session. 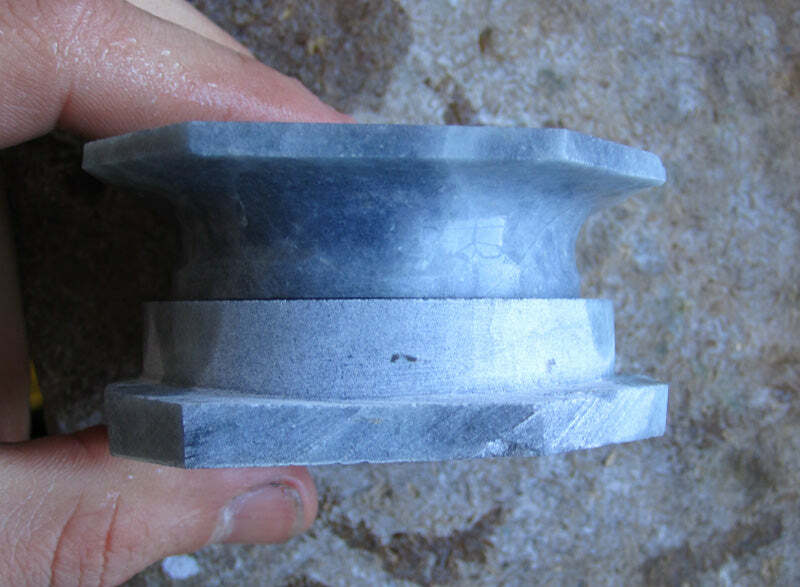 In the below photo, both pieces are fully shaped on the rear and in the center front, which leaves the outer flare contour as the remaining element before the polishing stage. 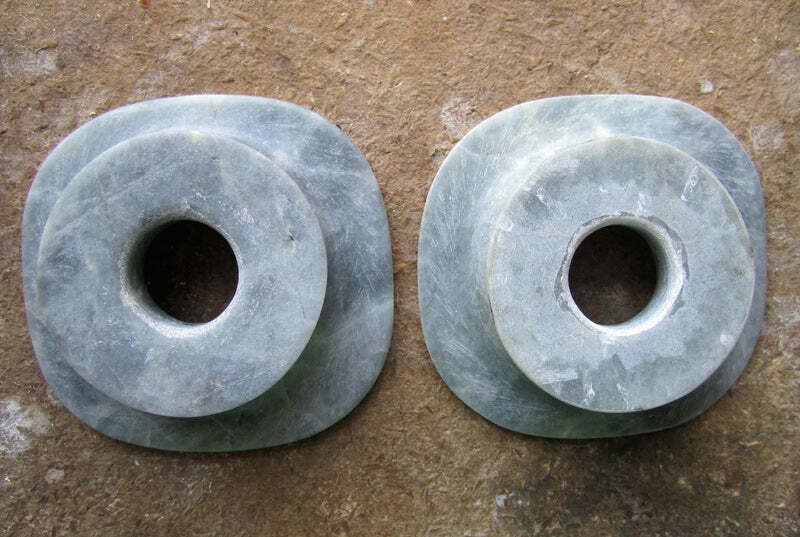 Prehispanic jade ear flares were often created from river cobbles by drilling a hole through the piece and then bisecting it to create two hollow halves for further grinding. 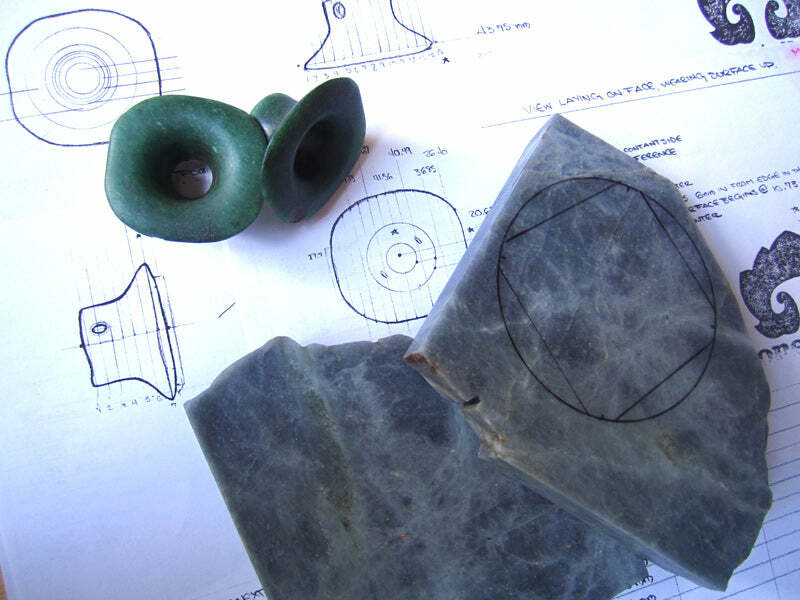 The result of this was sometimes an irregular or natural edge (the outside contour of the stone) as appeared to be the case with the original Mayan aventurine ear flares being reproduced. I felt that one piece had a much more pleasing contour than the other and decided to use this line for both reproduction pieces and mirror them to mimic the "bisected stone" quality of some antique pieces. 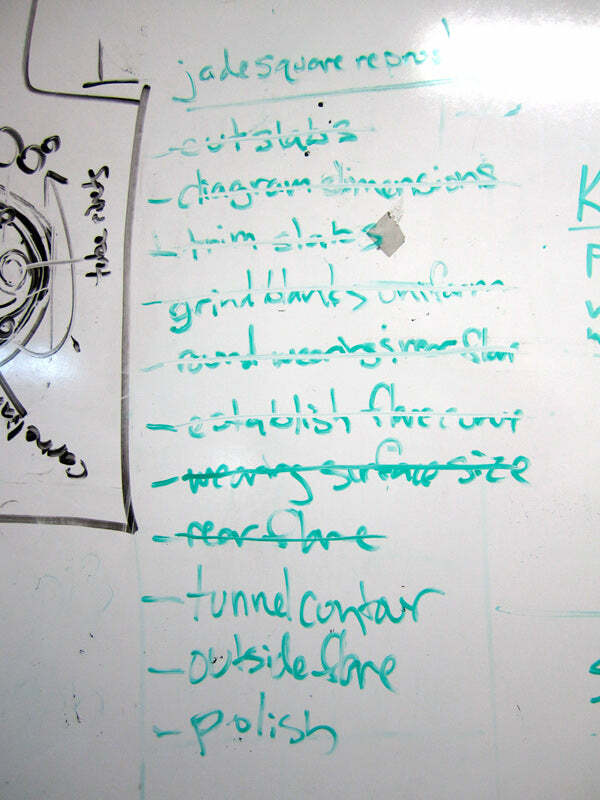 With all of the grinding and contours worked out, the remaining step is finishing. I ended up doing this the hard way for two reasons. 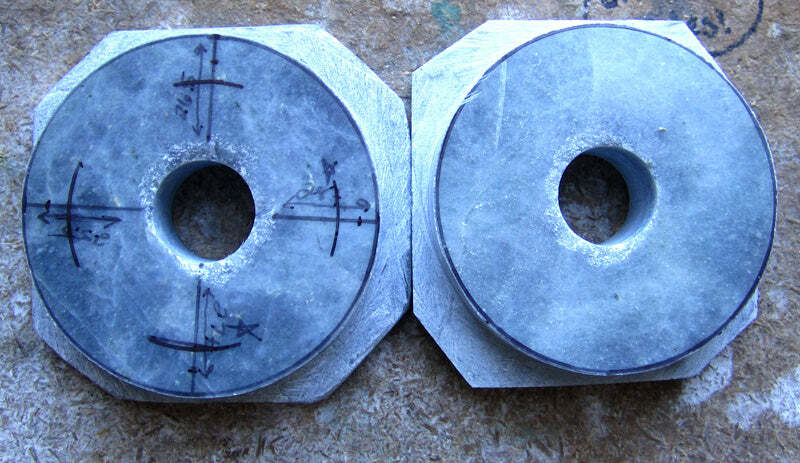 The first - due to the extremely drastic curves in these pieces, they could not be worked against polishing wheels on the grinding machine. I also did not want the glassy finish commonly associated with diamond wet polishing. 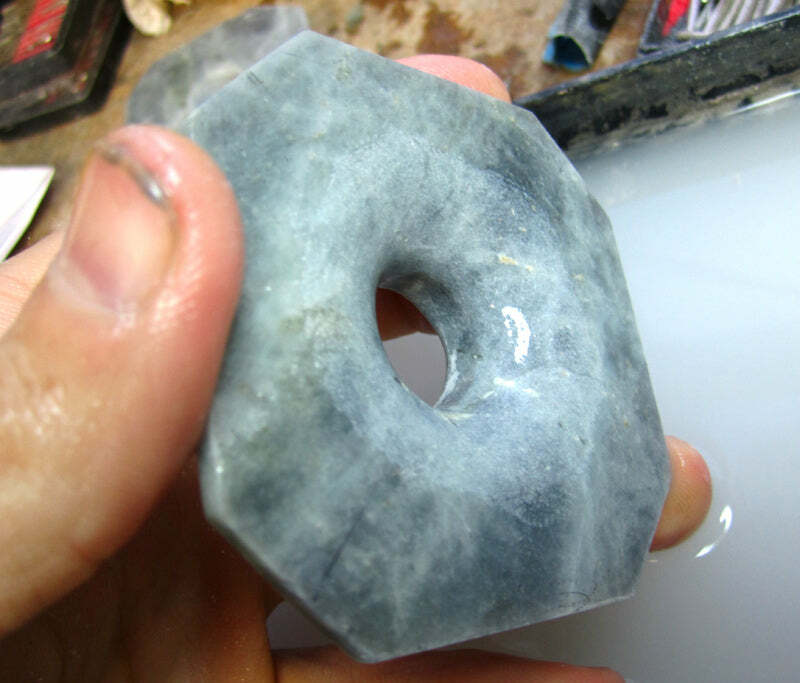 How do you get an 'antique' finished on a piece of jade? 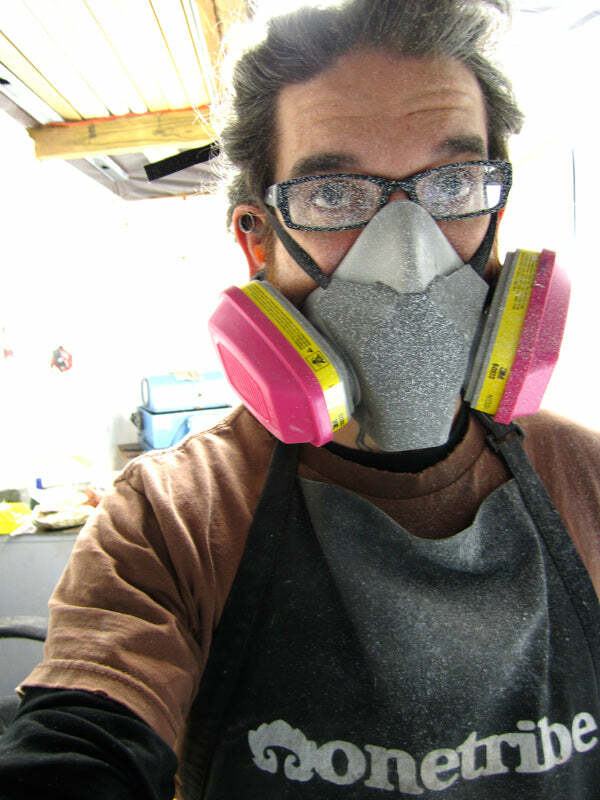 By doing it old school and sanding the heck out of it. In antiquity, this would have been done using a slurry of sand and/or jade dust and water. Using some modern technology (sandpaper) and a considerable amount of arm stamina, I hand sanded this jade to a suitable finish over the course of several days. The finished pieces measure 45mm wearing size with about a 3mm (1/8") rear flare and front flares that vary from 2.5" (63mm) side-to-side to near 3" (76mm) on the diagonal. 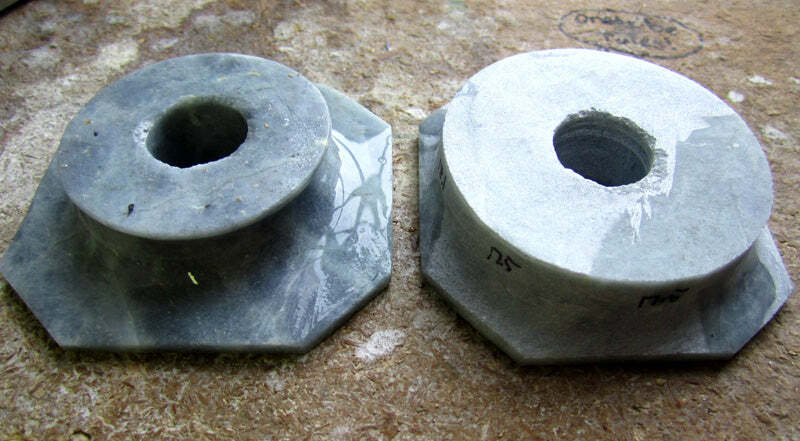 The weight is almost exactly 100g per piece, making them fairly heavy but surprisingly lightweight for the mass of jade, and fairly well balanced considering the extreme size of the front face. I am very happy with the completed project, and I hope that the customer will be as well!